This booklet proves once and for all that confrontational evangelism is the predominant model of evangelism in the New Testament. It is written for pastors, missionaries, evangelists and believers who are passionate for evangelism and for those who are not yet convinced. May the Lord use it to raise up laborers for the harvest. "Jon Speed has done a wonderful job of showing exactly what it means to fulfill the Great Commission. 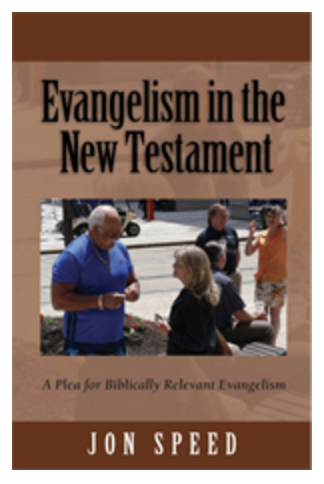 Evangelism in the New Testament will be a great source of encouragement to those who want to do what Jesus commanded us to do--to go into all the world and preach the gospel to every creature." "You put into definitive terms what the majority of my personal beliefs are regarding the discussed topic. Your use of pie graphs are, I believe, a great demonstrative tool in emphasizing the statistics. These sorts of tools are quite necessary when presenting a topic of this nature to a potentially disagreeable audience. It could easily be argued that this should be mandatory reading for all pastors, elders and deacons."